Listen up! I need you to read this post in full and help us right here right now. 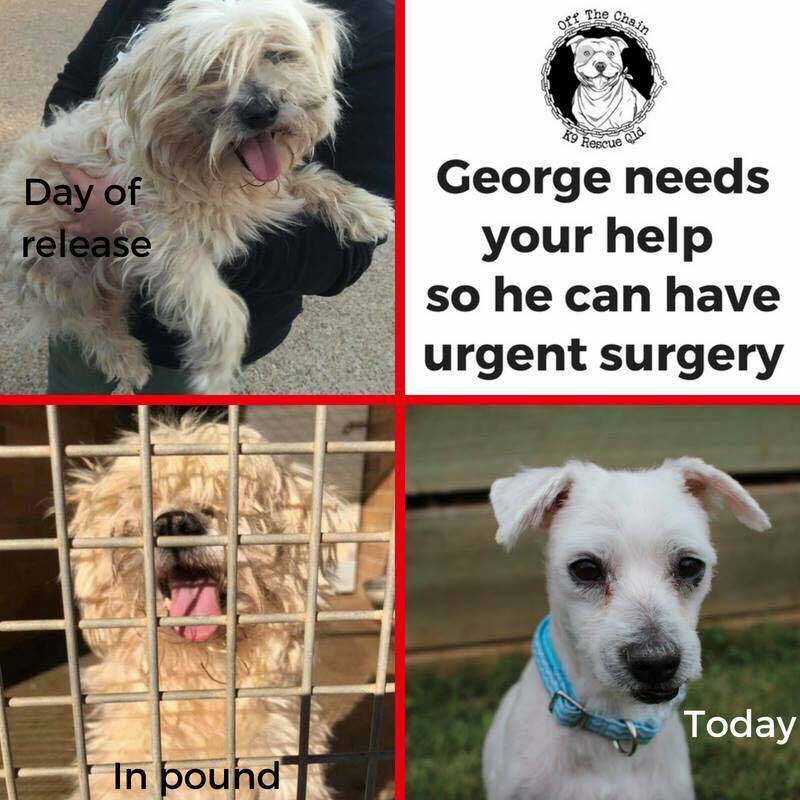 George needs urgent surgery. George is one of many dogs we saved recently from the council pound. We could tell by his matted fur etc that he hadn't had the best of care, but we didn't expect him to be this sick. Regardless, we aren't scared of a fight and George is more than worth it. George has severe periodontal disease – several teeth are infected around the tooth roots He also has cataracts in his eyes. Of real concern is that his testicle is inside his belly – we need to get this out ASAP. We have tentatively booked in for the coming week but we can't proceed if we don't get the funds raised for his surgery. We desperately need your help. Our bank balance is at an all time low. This surgery will cost approximately $800 and on top of that our last fundraiser did not reach goal leaving us short $2,000 for poor BUGS. If just 560 of you donated $5 each we would reach our target of $2,800. Please do not just scroll past his post. Our time of need is now. This is your big chance to help us. Without your help George cannot have his surgery and we cannot continue helping poor neglected dogs like BUGS. Please please help us today. Let us sleep easier knowing we have the funds for these two gorgeous but neglected animals. Anything for your wonderful charity and for the abandoned pets. Wishing you a speedy recovery George! In memory of our own dog Sooty. Hoping Bugs and George get the help they need and make full recoveries. Sending love and hugs. Wonderful work you do team! Good luck little dude. Get well soon! Good luck guys! Thank you for the amazing work that you do, we are forever grateful! Get well soon beautiful George.